The 116DEGEX-FJ is a regulated 24 volt, explosionproof fire alarm strobe that can be synchronized when connected to compatible Kidde fire alarm panels and power supplies or with the use of a separate synchronization module. The strobe is UL1971 listed with a 125cd ceiling rating and a 60cd wall rating. The strobe has a Class I, Division 1, Groups C & D, Class I, Division 2, Groups A, B, C, and D, Class II, Division 1, Groups E, F and G, Class II, Division 2, Groups F and G, and Class III Division 1 and 2 hazardous locations. 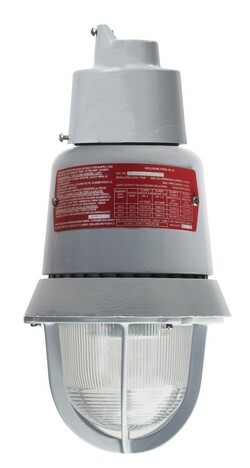 The strobe is also cUL Listed as a Type 3R and 4X enclosure. The beacon can be wall, ceiling, or pendant mounted with the addition of separate mounting hardware.